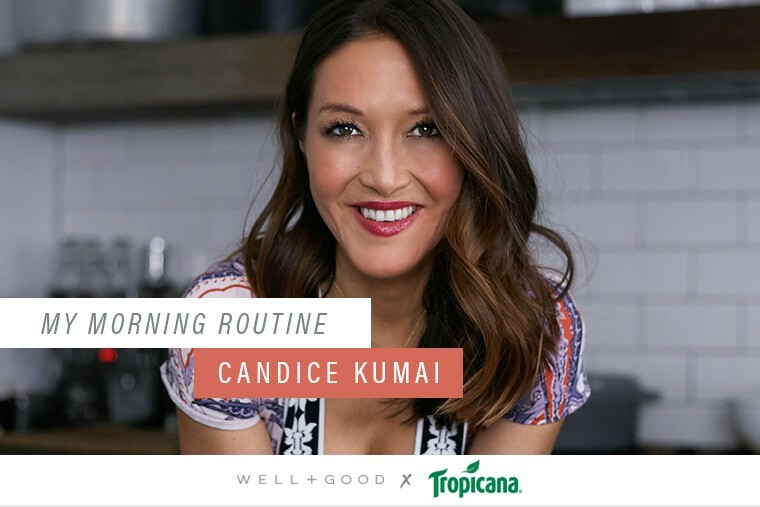 Welcome to My Morning Routine, where Well+Good Council member Candice Kumai and other good-life gurus share their personal (frequently surprising, often healthy) morning rituals—to help you make your a.m.’s more awesome. We teamed up with Tropicana, America’s first and favorite orange juice, to find out the day-starting routines the best-selling author and professional chef uses to make sure she’s keeping it real all day long—and inspire others to do the same. I love mornings more than any other part of the day because they remind me to be grateful for everything I have. I just moved into a new waterfront apartment in Brooklyn that I worked super hard to get on my own, so I use the energy of the water and the city itself to keep me motivated to wake up and get going. I usually wake up around 6 or 6:30 a.m., and if my body wants more sleep I just allow it—when I can. I don’t usually use an alarm clock, but when I do, like when I have to wake up extra early for traveling, I set two—my grandma’s old alarm clock and my phone. But the rest of the time my phone is not allowed in my bedroom. Sometimes my cat is in bed with me, and she’s like another alarm clock because she’ll meow or start to massage my arm. For breakfast, I’m a big fan of making a chocolate smoothie with lots of greens, or sometimes I’ll add fruit juices to my smoothies. I always look for varieties that are 100 percent juice and contain beneficial nutrients with no added sugar. I also really like having avocados, sometimes with a touch of miso paste. Flavor really is everything in food; I like something that’s not too sweet and makes me feel energized for the day. One of the first things I always do in the morning is fill up the kettle with water and put it on the stove. I really enjoy making my matcha the old school way with traditional Japanese matcha powder, a chawan, and a chasen, the Japanese tools that everyone in my family has used. But I also think matcha is an acquired taste. A lot of people join things because they think they’re cool and trendy, but I think the important thing is to always stay true to what you love and what makes you feel amazing. We can learn so much from our ancestors versus trends. After that, I meditate for 30 minutes. I usually feel a lot better after that. And if 30 sounds like a very steep number, it did take me awhile to get used to 30. Everyone should start with just five minutes, then move to 10, and before you know it, 30 flies by. I often reflect on the influence from my parents. My dad always says, “always do your best.” In Japanese the term is ganbatte. So every day I strive to do my best by being honest and being real. That, and ki yo tsukete (which means take good care of yourself) are my two biggest mantras or life anthems. Then, I move over to the computer and write before everybody hops on email at 9, otherwise I won’t get anything done. I stay away from emails first thing in the morning. I give myself the morning to try to be creative without interruption. By the time 11:30 hits, I get ready for a workout. Sometimes I do yoga or run, but lately it’s been barre. Afterward I catch up with my girlfriends there. I make sure to socialize because that’s a really big part of life and staying sane. Then I’ll go write some more at the park or a cafe. Instead of being overwhelmed by my list of tasks, I try to focus on one task at a time and do it really well. My dad always says, at the end of the day if you can look back and say, “I did my best,” you’re probably doing something right.